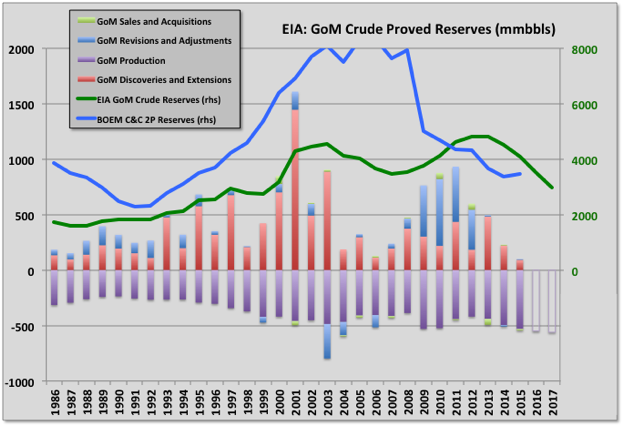 EIA provides estimates of proved reserves based on information from the E&Ps on form EIA-23 for crude only, and also shows the categories for changes (discoveries, production, revisions etc.). This data with updates for 2016 has been due since November but so far has been twice delayed. BOEM make their own estimates for 2P (i.e. proved and probable) based on strict adherence to SEC/SPE rules (i.e. the reserve must be on production or be expected to be produced within five years). I think this usually comes out in May. In the absence of the latest EIA numbers I’ve presented the 2015 numbers with adjustments for subsequent production. There will be revisions and additional discoveries to include once the actual data is available though I think fairly small, especially for gas, but it will be interesting to see. 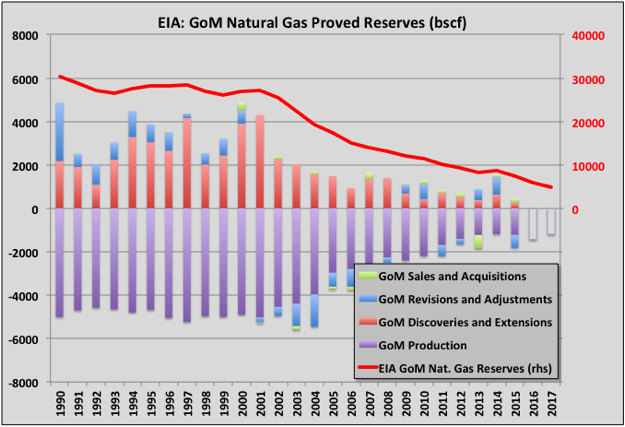 Despite excluding probable reserves and counting crude only, the EIA estimates have recently exceeded those from BOEM. It looks like a lot of the probable reserves were converted to proved through positive revisions in the period 2008 to 2011; i.e. 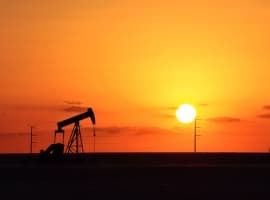 possibly due to some price increases then, but also immediately following the SEC rule changes to exclude reserves without firm development plans, which may or may not be coincidental: the E&Ps may be less strict on applying the SEC/SPE rule, which they are allowed to do for large, long term projects. The BOEM estimates are pretty much flat over recent years as additions (which then become backdated “discoveries”) from new projects going through FID balance production, whereas EIA estimates are declining with revisions recently zero to negative. Sales and acquisitions mostly balance out, sometimes with a year or so lag, though overall slightly positive, which I guess means the purchasers are able to get a bit more from the fields than the sellers. There are few extensions to conventional fields (unlike LTO where they are the largest positive factor) and discoveries have trended down significantly over the last three or four years (this would probably have happened a couple of years earlier but for the drilling hiatus caused by the Deep Horizon accident). 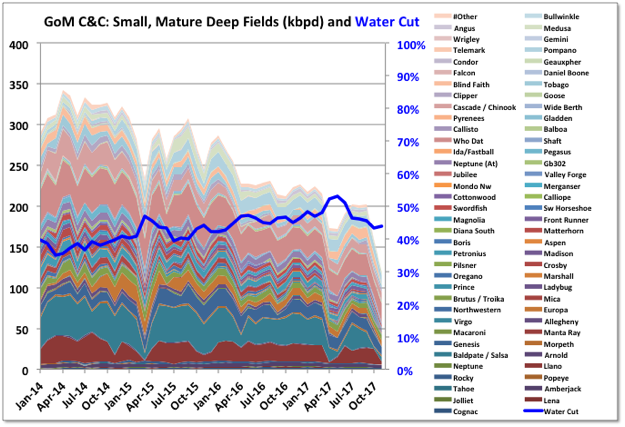 For November the production losses from Hurricane Nate have been recovered but more than 100 kbpd streamday was lost because of the subsea connector failure on LLOG Delta House Rigel template and the Shell Enchilada gas line failure. Total oil by BOEM was 1675 kbpd (up 211 kbpd m-o-m but down 16 kbpd y-o-y) and by EIA 1666 kbpd (up 209 kbpd from October, but down 21 kbpd y-o-y). Note that several leases did not report November numbers so I have had to estimate production based on data from the months before the hurricanes started to have influence. New fields production has peaked for the time being, even allowing for the offline fields. Stampede might give it another boost once it comes on-line soon. The smaller additions are generally in decline, but there has been some in-fill additions for Horn Mountain, Holstein and Phoenix. The large platforms, and Mars-Ursa should be considered with the ones listed, are holding and increasing production the best. I don’t know how much more there is to come, but certainly Tahiti and Atlantis have large brownfield developments in progress. The larger ones shown are around ten years old, which would normally be seeing the end of a plateau period, but equally they tend to have a lot of excess processing capacity. If nothing else some of them must be due for major turn-arounds in the next couple of years, which would take about as much production out for a year as Nate did. The smaller, mature fields took a hit with Enchilada offline, but maybe not as big as might be expected given their continuing steep decline. Shallow fields continue to decline. There was some headline news with Byron drilling the South Marsh Island 71 block, but it only has about 4,500 bpd capacity. The Enchilada pipeline is still offline with no date for restart published yet, which is keeping about 75 kbpd oil production offline from Baldpate, Salsa, Cardamom and Magnolia since early November. The workers injured in the incident have started proceedings against Shell for compensation due to safety failings. All these fields were in fairly steep decline so the production, and therefore revenue and interest, is only lost while they are offline rather than being deferred several years as would be the case for a system on plateau. The subsea failure on the Rigel manifold feeding Delta House has resulted in Rigel, Otis and Son of Bluto 2 being off line for most of October and all of November (about 40 kbpd capacity). I have seen no news that this has been repaired. Without these two major unplanned outages November would just about have beaten the March record for production. 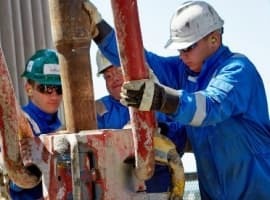 Maersk Drilling have lain off workers that had been working on the Maersk Viking for ExxonMobil’s Julia field, which seems to have finished although there had been plans for a phase II there. 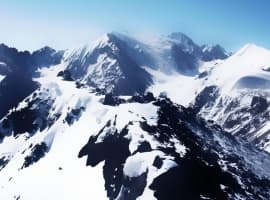 It had been in quite steep decline but there has been about 6,000 bpd increase in the flow over the last two months and it may be near a new peak. Stones drilling has also stopped, it has a nameplate of 40 kbpd but has only so far exceeded 30 for one month. Heidelberg drilling too, has now stopped and it has achieved about 40 kbpd of a nameplate of 70 kbpd; phase II is due in 2021. Tornado II started production in mid-December at about 10 kbpd oil. Combined flow for Tornado/Phoenix is currently reported at about 21 kbpd oil, or net 8,000 bpd up on the average for Tornado I alone. There’s also been a big increase in the Horn Mountain lease, which has gone from less than 10 kbpd and declining in May, to now over 32 kbpd. Two non-quantified discoveries have been announced as variously “major”, “significant” and “amongst our biggest”: Whale for Shell/Chevron, which does sound pretty big and is near the Perdido platform, and Ballymore for Chevron/Total, which is near Blind Faith. I suspect both will be tie-backs as the reason for concentrating on near field exploration was to save money on subsequent developments. Perdido has 100 kbpd nameplate and currently produces 66 kbpd, and Blind Faith has 60 kbpd with over 37 kbpd capacity available, and rising. Appraisal drilling is continuing on both, and that hasn’t always been as great as the initial announcements (e.g. Kaskida, Shenendoah and, recently, Phobos). I’m not certain but think they both may count against last year’s discoveries and the announcements have been delayed to be immediately before the 2017 financial statements. 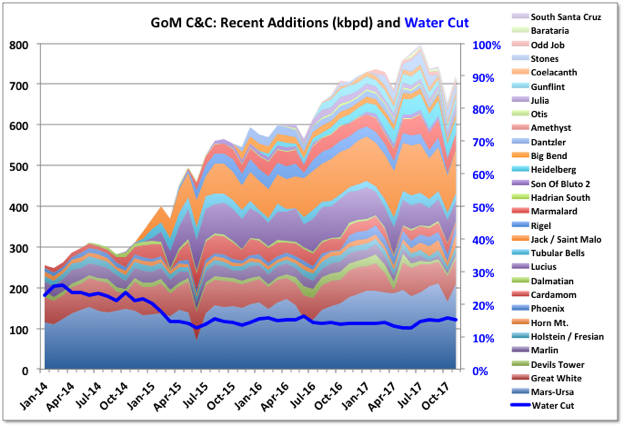 Wood Mackenzie was reported as giving predicted 2018 GoM deep-water production of 1935 kboepd, a new record. I think this is an average rather than a peak or exit rate, but I couldn’t find for sure. Note this is oil and gas (reported as including 80 percent C&C, I think, but could be total liquids) and doesn’t include shallow water, which may be below 500’ (common industry limit) or 1000’ (BOEM limit) the report didn’t say. I don’t know why it was made so complicated, probably so they can declare a record of some kind which would help or try and sell the full report. Currently (early February) there are forty-nine deep-water well related operations in progress reported by BSEE. Thirty-four are drilling related, with five pre-drilling for future projects and four on unnamed fields (so wildcats or appraisals). Of the fifteen running tools one is for P&A on Tick, which is fairly shallow water. Numbers in brackets on the production charts show the number of listed activities for each field. 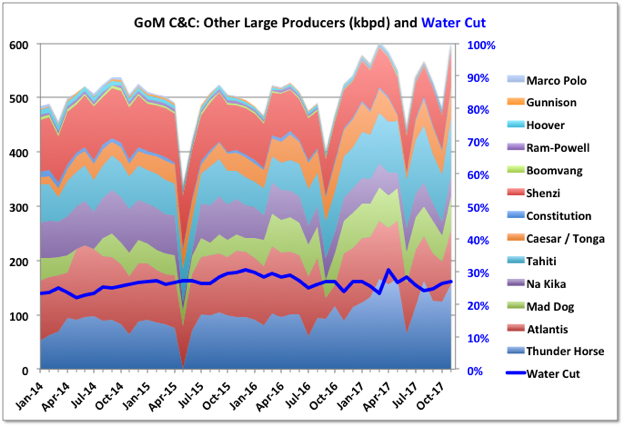 There is no current indication that the increased oil price is leading to increased drilling and the Baker Hughes count of active rigs has actually fallen slightly recently, though there may be signs of an uptick in non near field wildcats, but probably still early to say. Below is an updated projected scenario (i.e. guess) for future production. 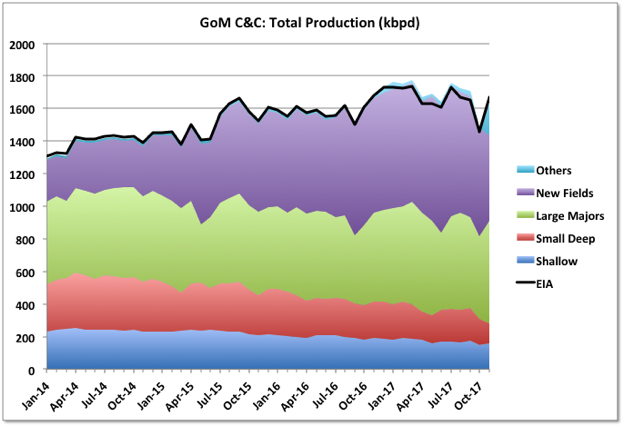 The total production in each section equals the estimated reserves for those fields from BOEM numbers for January 2016 less any production since then. Their estimates for this year (showing January 2017 numbers) have not yet been issued. For projects under development and discoveries I’ve used the E&P numbers for reserves, production and start-up where available or just made a guess. 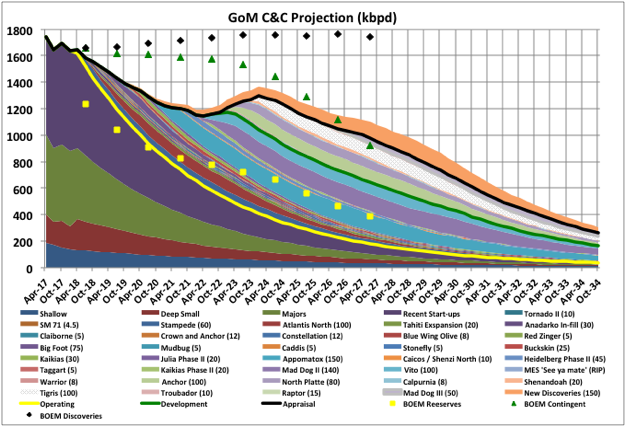 Numbers in brackets are nominal crude and condensate nameplate capacity for the expected development. I’ve included some nominal new discoveries with total reserves of 500 mmbbls, but may have to change that once the Whale numbers are announced. I’ve also shown the 2018 BOEM production forecast, which I don’t fully understand. For instance they have on-line production suddenly dropping about 400 kbpd this year, but being made up with contingent numbers, which I would have assumed is possible development but can’t be; but also can’t be planned start-ups because there is nothing like that amount due this year. They also have a large amount of new discoveries that come on line very quickly – i.e. ten years to bring on line 800 kbpd, which would be some combination between eight big discoveries and eighty smaller tie backs. 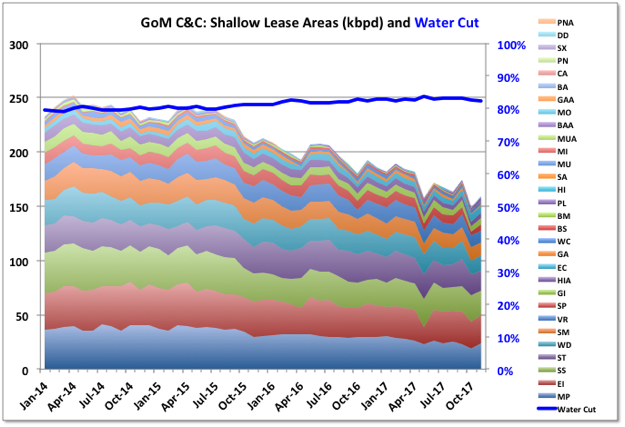 Nothing in recent history of exploration success or lease sales, or usual cycle times for deep-water projects, would suggest that is likely. 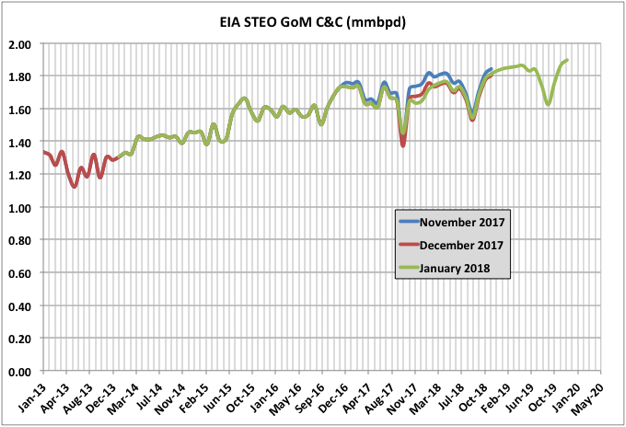 EIA STEO has its normal steady exponential rise, now extended through 2019, with bites out for hurricane season.